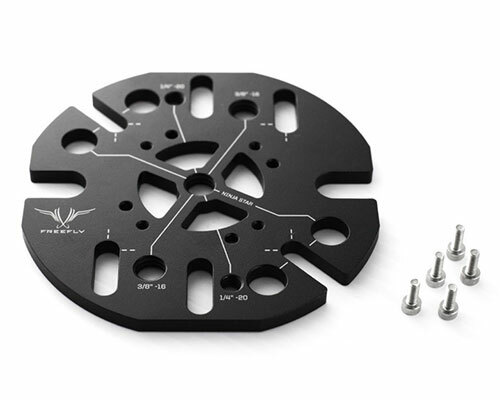 This adapter plate allows for mounting the MōVI to a variety of accessories. It is designed to replace the top handle of the MōVI and allow users to mount to Steadicam, Tripods, Jibs, Car Mounts, etc. The plate is lightweight 6061-T6 hard anodized aluminum with laser engraving that calls out mounting patterns and hole sizes. The Ninja Star is optimized to provide the most mounting options possible while minimizing size and weight.